Following our ski of the Avalanche / White Salmon Glaciers on Mount Adams, Cyril and I drove to Mount Hood and reached the gate at Inspiration Point (4600 ft, about 3.5 miles up the Cloud Cap Road) in time to enjoy a long and majestic sunset on the north side of Hood. Our plan was to ski the Sunshine Route from the summit the next day and route conditions looked good, with lots of ski tracks on Snowdome and a boot track visible crossing above the major bergschrund of the Coe Glacier. However, I was somewhat tired after Adams and the thought of a lengthy hike the next morning up the road and Wagon Trail was not very appealing, much less the 6600+ vertical needed to reach the summit. I suggested we find a different plan and after much discussion, we decided to try to ski the Leuthold Couloir with an assist from the lifts at Timberline Lodge. Overnight, trouble was brewing as the temperature refused to drop below 60 F at 4600 ft even by dawn, about 15 F warmer than the previous night on Adams. This would certainly mean a very incomplete freezing of the snowpack, with radiational cooling likely to freeze only a few inch surface layer and deep unconsolidated mush underneath. Definitely not ideal for a steep ski descent. Anyway, we enjoyed the sunrise on the north side and then drove to Timberline, which was absolutely packed with throngs of summer camp skiers. We fought the crowds and yo-yoed the Palmer lift until 9am on nicely softening corn, and then skinned up to Illumination Saddle on the expected funky snowpack of 2-inch thick surface crust with a foot or more of mush underneath (just skinning caused the surface layer to crack and settle in many areas). 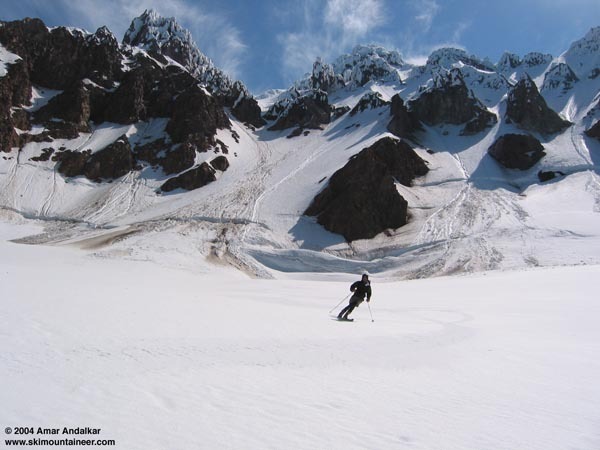 We met a pair of climbers who had just returned from a climb of Reid Glacier Headwall (descending West Crater), they reported similar funky snow conditions and numerous rocks and ice chunks coming down the route. Not good. Anyway, we decided to ski down onto the Reid Glacier and have a look at the Leuthold and Reid Headwall ourselves. The first steep NW aspect was still firmly frozen, but the snow on the west-facing Reid was nicely corned. Lots of debris had come down the Leuthold and Reid Headwall onto the upper edge of the Reid Glacier, with major debris channels carved into the center of each route. The bergschrunds all looked passable and the routes looked to be skiable, but were thoroughly unappealing to me in their present condition. Plus every time we stopped talking to each other, the clatter of rockfall could be clearly heard within seconds. Nothing major, just lots of stuff coming down, as expected. So we decided to ski the Reid Glacier instead and enjoyed over 1000 vft of really excellent corn atop a firm supportive crust, with minimal crevasse hazard. The major icefalls of the Reid begin below 8000 ft, and Cyril chose to ski down through them alone and exit by climbing a steep snow slope out to the south near 7000 ft. I decided the much safer course would be to just skin back up the Reid and out to Illumination Saddle. By noon, I was zipping down the Zigzag Glacier on some nice SW facing corn and then traversing deep mush back to the groomed slopes of the Palmer. I yo-yoed the lifts until closing time at 1:30pm, getting 8 more runs on a fast and fun surface with no lift lines, and Cyril made it back in time to join me for the last couple of runs. He reported the rest of the Reid Glacier had been in good condition, with obvious snow ramps through the icefalls and a manageable climb back out to the Zigzag Glacier. Although we didn't get to ski the Sunshine Route from the summit, we did enjoy a nice day of skiing both on the groomed runs and on the wild expanse of the Reid Glacier. Cyril carves a turn on the smooth corn of the Reid Glacier, with the Leuthold Couloir above left and the Reid Headwall above right. Click here for an enlarged version of this photo.